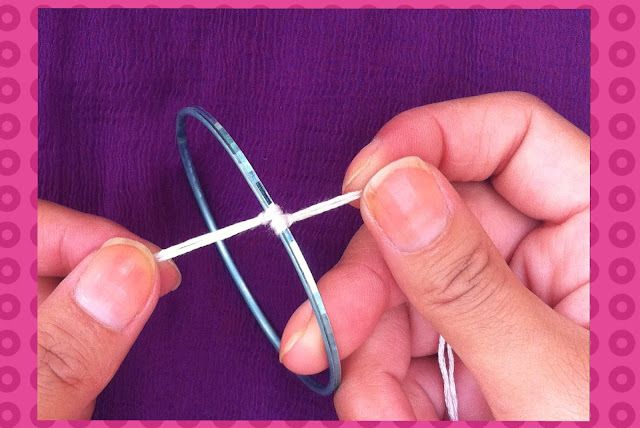 Today I am going to tell you how to make bangle bracelets at home. The would like to give the credit of these to my school. In every summer vacations I was given same homework to make best out of waste. Doing it in every holidays has inculcated this thing that I never every throw anything just like that, I preserve it and think if i can use it to make something. Today I am going to make bracelets out of few old bangles and threads with were lying around the house. 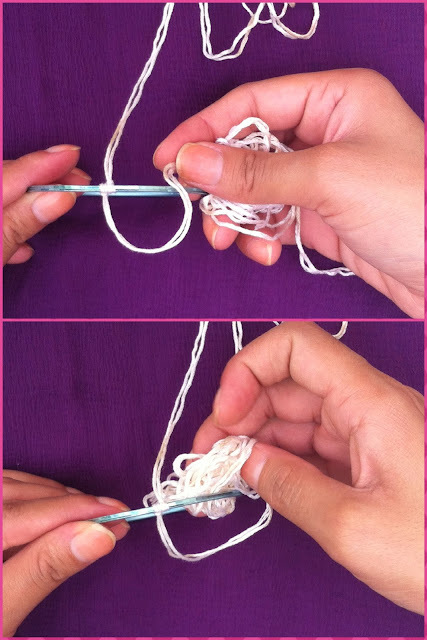 1) Take two pieces of thread and fold then in half so that each part is 52 inches long and form this loop. now put this loop under the bangle. 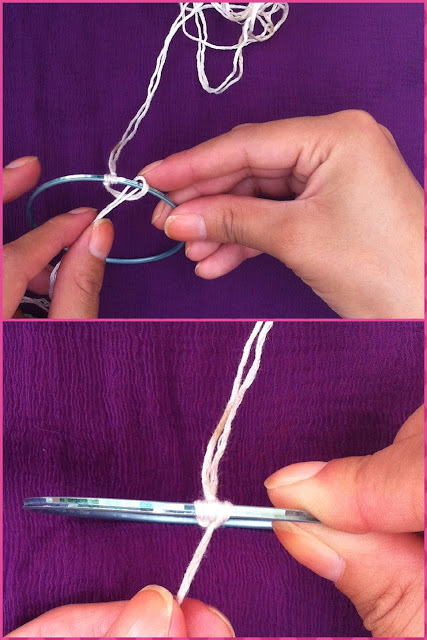 2) Now pass the other end of the same thread through this loop from the top of the bangle as shown. 3) Pull it through the loop. 4) Repeat the process with the other piece of thread from the opposite side and you should get something like this. 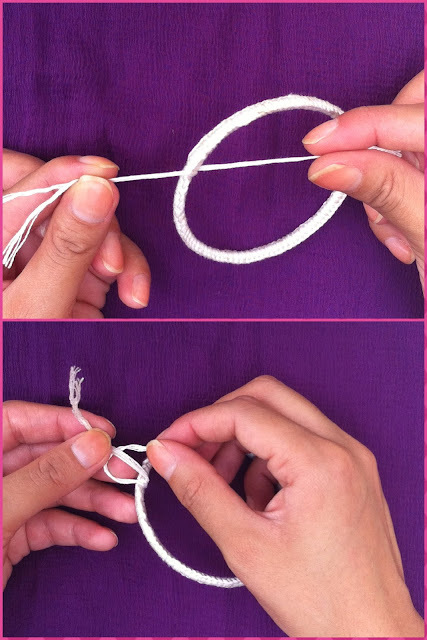 5) Now take the first piece of thread and loop it as shown below. 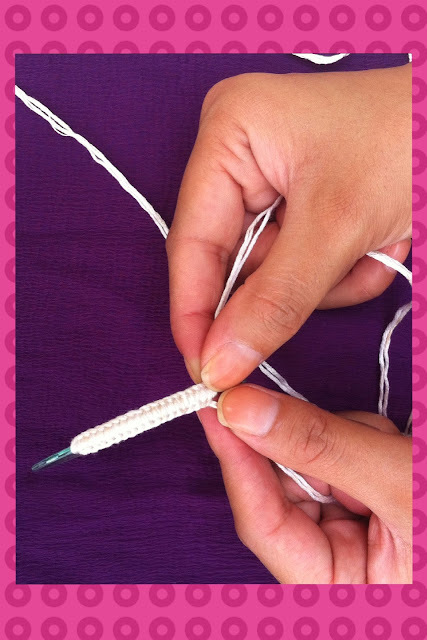 6) Pull it tight and you have got your first stitch. 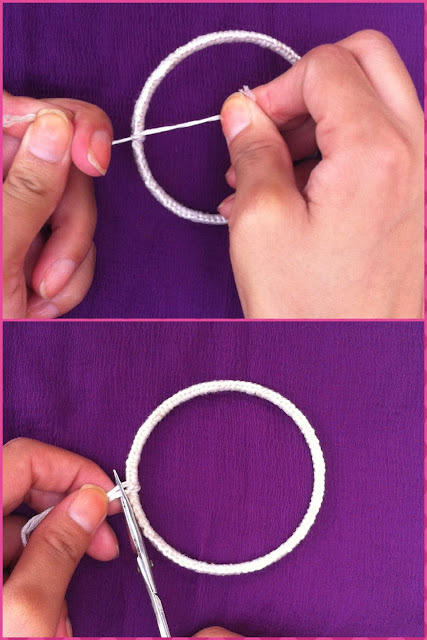 8) Once you are done and entire bangle is covered you will be left with two pieces of thread hanging from opposite sides. Tie then together to seal the stitches. 9) I like two tie then twice and that two very tight so that it stas in place. Then cut the remaining thread off. 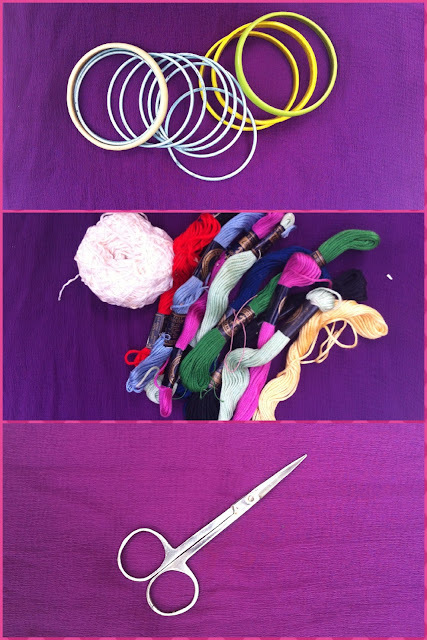 1) Use 2 different color threads . 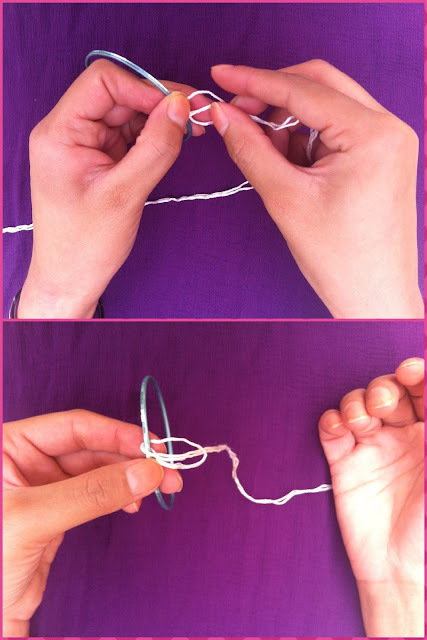 2) Folding thread 4 times rather than two. 3) Folding thread four times but using 1 fold of one color and other fold of other color. 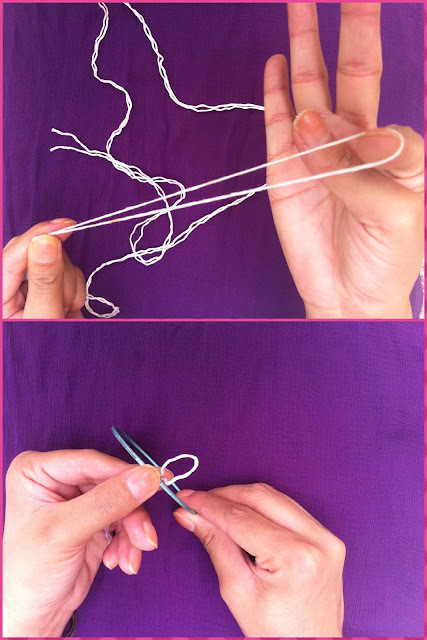 6) Rather than going for alternate side threads, go two stitches on one side and one stitch on other. The variations are endless. All you need to do is just get creative . It looks so cool on . With friendship day around the corner you can also use it as a gift or a friendship band. Well mot exactly a friendship band , but I this it can be used as one as it can be used later by the person you give it too. Hope this posts is helpful for you..
Wow. Nice post. Very detailed. You are a diy genius I will never be able to do this great job doll. Will share with my nieces. What a great DIY post. Love it! Great invention and that's very creative but I wish I had the time to make my own bangles. This is very, very clever! This is great! :) Thanks for the inspiration! Im glad , happy u liked it..
so cute. I can actually use this. I have some old bangles that I'm starting to hate because of the smell of metal. Perfect , try this out to pep up your old bangles..
You really did a great post, very clear and explicative! This idea is so cool! I love it! Thanks a lot for the lovely comment, off course i will follow you.. I never thought about this, very creative. Some of the things we did at school ware awesome. I'm going to try this hopefully over the weekend. great DIY! bracelets look amazing! Cool! Thanks for this tutorial!!! perfect diy! done with university exams and a summer ahead of me, I needed some good craft-y thing to do!! Well, i wont lie it need some patience..
wow♥ that's amazing! :) I wish I was so creative too..
Pooja i love this post! I love your blog.. it's great as always! Wow, so nice post! So interesting and cool! Wow, Spectacular post delineated beautifully. Thanks a lot , glad you liked it ..
such a cute DIY, they're so pretty! Try it once ul feel its so easy..
Great inspiration!! you're so creative!! Thanks a lot for the comment ..
Great DIY project! I love it. Glad you liked my blog.... Off course i. Will follow back..
thank you for the lovely comment on my blog. i am following you on gfc and bloglovin now. 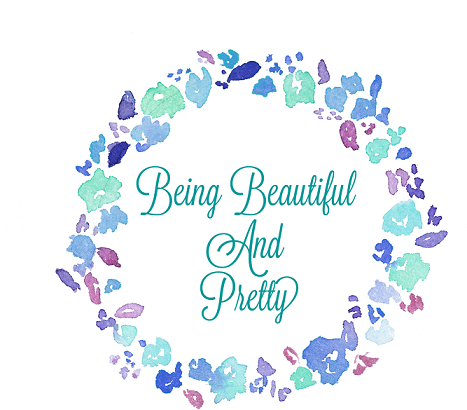 hope you can follow back and i am loving your blog as well. I have to try to get them!! looking stunning as always my friend! Totally loving this diy! Love this idea, great blog! Such a great how-to post. I love learning how to make new jewelry. I'm such a klutz at handicraft that I think I would need a video tutorial. I love making "friendship bands" back in school. 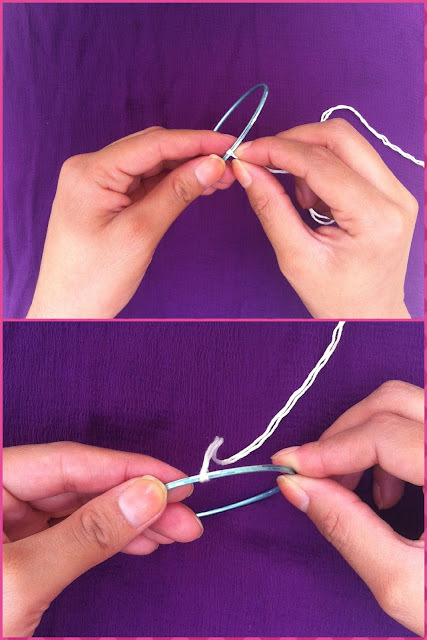 It's all about tying knots and it looks complicated though it's very easy. I'm sure this is very easy too once I grasp it. Thanks for the instructions. Must try! This is very simple and creative… anything made by self is worth gifting than getting from shop. What a great DIY - thanks for sharing, dear! Aww these are so sweet - look really good! Wow, I don´t think I ever had the patience for that..amazing!! Great DIY! I am definitely going to try this out! 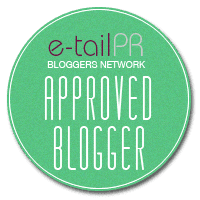 Followed you on Bloglovin! very cool! great way to save money too. and thank you for commenting on my blog, of course i would love for us to follow each other. followed on GFC and Bloglovin', now just waiting for you. 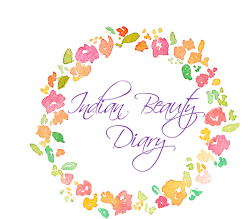 lovee it, just followed ur blog, lets follow each other!! Thanks for stopping by my blog. I'd love for us to follow each other. Great blog! here in Italy is so hot it reminds me my stay in India. Great diy, I like the idea !! Very good DIY idea! You do it right! But unfortunately I do not have instagram, follow you dea other places. wow !! these does luk gorgeous...but, my1 u wud have taken ages to get one done !!! real patience you have. hope you accepted my "hug" form my previous post on hte award that you gave me. Wish you a Happy Friendship Day !!! This is a great post! Indeed perfect for this friendship / sister's day! Thanks for the details by details photo! Would you like to follow each other? Let me know, I'll return the love pronto! Thanks for teaching us how they are donne! Very nice bracelets!!! Thanks for your class! Kisses! I would love the multi strand charm bracelet, I haven’t made one like that yet. It would be a fun opportunity to explore a new style. Thank you for sharing. Hey Sydney! Check out Luca + Danni online shop! 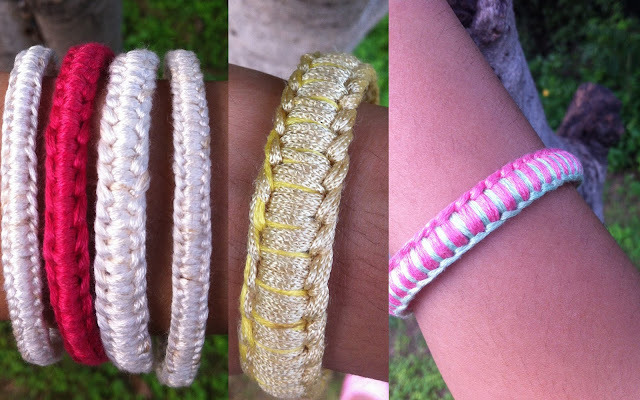 They do sell similar bracelets and all other handmade jewelry for a reasonable price! Worth to look at! XOXO! Feeling anxiety is a part of our mental health, and feeling unnecessary anxiety is a part of our mental disorder. This is a great post! Looks like style AND comfort in one! You have a really good match between the wool and the beads too! Find more Silk tread Bangle online in USA. Great Post. I have been really impressed by going through this awesome blog.Thank you for sharing us. Check out more designs of Silver Bracelets at reasonable price.